Foreigners of course splash around most of the year, to the extent that anyone viewing a beach-photo snapped in early spring or early winter, would be hard pressed in guessing when it was taken; locals huddled forefront in winter-wear, and the typical northern tourists frolicking in the sea in the background. The most popular sandy beaches are up to the North of the island, and preferred by those having a dip earlier in the season given that the Eastern-facing Sliema front, including that off Tower Road, is usually exposed to rougher seas and treacherous currents. The Tower Road seafront apartments, setback at a comfortable distance from the foreshore, enjoy the scene all year round though. In winter the rough sea breaking surf on the rocky coast makes for a postcard view, and in summer, the seafront terraces beckon a lazier morning with a refreshing dip just a stroll across the road and down the steps. As the sun sets in the West behind the apartments, an evening sea breeze rises, the sea disappears beneath the distant twinkling lights of fishing boats and partying pleasure cruises, and the sinewy coast line sparkles up in a myriad of pin-prick lights from the St. Julian's bay and peninsula across the shimmering waters . 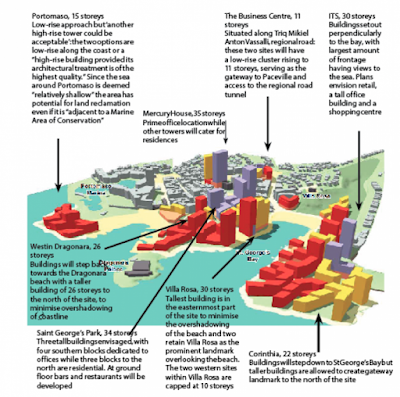 Increase in construction activity to result in vast quantities of construction-waste which would increase pressure to use this material for land reclamation projects which will only be viable if more apartments are built on reclaimed sea. The nine-mega developments in Paceville are expected to create between one and two million cubic metres of construction waste - more than the total amount of construction waste dumped in a single year. The amount could increase further with the excavation of a tunnel proposed under regional road earmarked for after 2018. Altogether, the nine Paceville developments included in the master plan will create 1.17 million square metres of new ground space set on different floors-which is nine times that of the combined Mriehel and Sliema towers approved by the Planning Authority in August. The two projects - which have a combined gross floor area of 135,149 square metres - will together generate 276,115 cubic metres of excavation waste. The Civil Protection Department is in the coming weeks proposing a number of fire safety regulations for apartment blocks. The measures follow recommendations in an inquiry led by Magistrate Joseph Mifsud following a fire at 77 “Waterways” Flat 3, Triq l-Aħmar, Marsascala, during which a man had lost his life. Six people had also been hospitalised. They include that fire drills led by the administrator should be carried out in every apartment block, that each block should have fire extinguishers u fire blankets at a place that was visible and accessible and that there should be a smoke and fire detection alarm in the common area. Other proposals are for emergency exit signage, easy accessibility to roofs, and that callers to emergency number 112 should give as much information as possible and identify a landmark for a faster response time. The government this morning announced a new scheme which will enable tenants to redeem temporary emphyteusis in residential properties administered by the Joint Office and the Lands Department. Government properties minister Jason Azzopardi said this would benefit hundreds of households, who would finally be able to become owners of their homes. He said the new scheme opens on February 20 and will run for six months. It will enable the tenants to redeem their groundrent at very favourable rates. Those who currently pay less than €5 per year as groundrent will be able to redeem their groundrent for €1,000. Those between €5 and €10 per annum will be able to redeem for €2,000 and those currently paying between €10 and €20 per year will redeem for €3,000.